The average cell phone bill is $139 a month, and according to a study completed by Validas in 2011, 80% of cell phone users are overpaying by $200 a year. My cell phone bill is $90 a month for four phones. Now I will admit that we don’t have smart phones and it took me several years of bargaining with my cell phone company to get my bill down that low. That doesn’t mean you cannot save money on your bill right now. 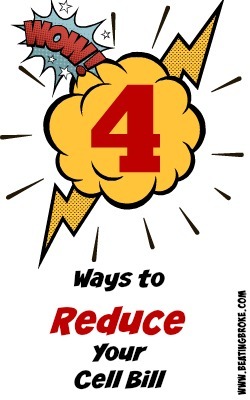 I am all about saving money, so here are four strategies you can use to reduce your cell bill today. If you’ve had your cell phone plan for a long time, look to see what you’re paying vs. what you are getting. Most people tend to keep paying for the same cell phone plan they have had for years, but just as your life changes, so should your plan. Check your last couple bills and see how many minutes you use, how much data you go through, and how many texts that you send each month. You could be paying for unused data or minutes. Don’t let the sales rep convince you to buy a larger plan than you need. The average smart phone user uses a little less than 2 GB of data each month, but the average person is paying for a lot more. With the availability of free Wi-Fi, most people use a lot less data than they assume. Getting a different job, having grown kids, or hobbies that have changed can have a big impact on how much data and minutes you need. Make sure you let your cell phone plan change as the rest of your life does. Depending on your job, you could be leaving free money on the table when you pay your cell phone bill. Tens of thousands of corporations offer discounts on their employees’ cell phone bills. Carriers provide these discounts to encourage employees to switch to their services. Corporate discounts can save you 5% – 25% every month. To see if your business is eligible for a discount, call your carrier or check your carriers’ website. If you’re a police officer, EMT, firefighter, teacher, mail carrier, or some other public service worker almost every major carrier offers discounts on your cell phone bill. After you’ve checked to see if you business receives a corporate discount, contact your carriers’ customer service to have the discount applied. Be sure to review your cell phone bill each month to make sure you are receiving the discount, because we all know how customer service works with these guys. Major carriers have started offering smaller, cheaper plans. The days of expensive unlimited data plans are in the past. Companies like Verizon and AT&T are offering affordable plans for families that won’t break your bank. For example, Verizon is now offering small, medium, and large packages to fit the needs of you and your family depending on your usage. If you can’t find a major carrier, there are hundreds of smaller cellphone carriers that offer cheaper plans. Companies like Republic Wireless, Freedompop, and others offer excellent service at a lower cost. Some customers of these “smaller” companies are paying $30 a month of unlimited text, voice, and data. Not only do these smaller carriers save you money, but they also tend to have happier customers as opposed to the larger “traditional” carriers. If you’re going to break your cell phone contract to go to a different provider, most companies will charge you $100-$200 for terminating the contract. Some carriers, like T-Mobile will pay to get you out of your old contract. All of the major cell phone providers offer a family plan to help save you money, but that doesn’t mean you have to be related to enjoy the savings. If you’re single or your family doesn’t need every line, find a friend or coworker that wants to split the bill with you. Sprint offers a family plan that has unlimited text, talk, and 10 GB of data for 4 people to share for only $100 a month. If you split this with 2 or 3 people, you’ll spend $33 or $50 a month. Verizon offers a comparable plan with unlimited talk and text, but with 12GB to share for $80 a month. Be careful of this plan, Verizon will also charge you $20 for every cell phone on the plan. You don’t even have to break your contract to merge accounts. Just have both people show up at the store together, sign some paperwork to transfer the line and badda bing badda boom you move all the lines into one account.